Never played the board game, never watched the movie. I know to some people, neither is a big deal, but for a kid growing up in the 80’s and 90’s it was crazy that I had never done either. And they both went on the list as separate items, because that’s how important they were. It’s like someone of my generation never seeing The Karate Kid … by the way, if you’ve never seen that movie, you need to go and watch it right now. 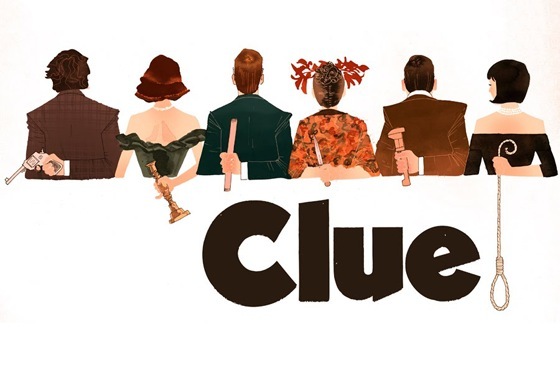 The comedy/mystery movie “Clue” was released in 1985, and it had an all-star cast, including Tim Curry, Eileen Brennan, Martin Mull, Lesley Ann Warren, Christopher Lloyd, Michael McKean, Madeline Kahn, Colleen Camp, and Lee Ving. It was based on the board game, with the same suspects, the same weapons, and even the same rooms all being featured in the film. The “suspects” from the game are all sent mysterious letters, inviting them to dinner at a mansion in the hills. They are given aliases, and all arrive not knowing exactly why they are there. They are greeted by Wadsworth, the butler (Tim Curry), and we learn of their aliases as they arrive. Eventually it is revealed that the thing that everyone invited has in common is that they’re each being blackmailed, and all by the same person, who they previously didn’t know the identity of. There is even an envelope presented containing damning evidence on each of the guests. Wadsworth reveals that the blackmailer is in fact the guest Mr. Boddy (Lee Ving). Wadsworth informs everyone that he’s called the police, and that the house is locked – Mr. Boddy can’t escape, and the group can now turn him in for blackmailing them (it is later learned that Wadsworth was also a victim of blackmailing, and this was his plan to bring Boddy to justice). Mr. Boddy tells the dinner guests that if they turn him in, he can tell their secrets to the police … he hands out the contents of a box he has brought with him: a rope, a candlestick, a gun, a knife, a wrench, and a lead pipe – one to each of the guests – and he says if someone kills Wadsworth, they can all keep their secrets. At this point, the lights go out and there is panic and confusion. The gun is fired. When the lights come on again, Mr. Boddy is dead on the floor. Whodunnit?! The rest of the film is a roller coaster of insanity as the guests try to figure out what happened, and as other people are introduced to the story. At the conclusion, there are actually three different endings to the film. When it was released in theaters, you only got to see one ending, depending on what screening you were watching. On the DVD, you can see all three, or you can have a random one played. Awesome! This movie was tons of fun. Although I was a little confused as to how it relates to the game with the exception of the use of the names, I realized that really is the main relationship – the characters, weapons, and rooms are the same, and the movie is built around that. The story is completely its own, and it’s hilarious. Tim Curry is fantastically frantic, the characters are wacky and larger than life, and the humor is classic 80’s. I really enjoyed this one. If you haven’t watched “Clue” or if it’s been a while since you have, it’s totally worth a watch. There’s also a remake in the works that’s supposed to be released next year!